What Is Single Incision Laparoscopic Cholecystectomy (SILC)? With the SILC procedure, you may no longer have to endure multiple incisions, visible scars and long recovery times. The SILC procedure can minimize these concerns by allowing surgeons to perform a gallbladder surgery through a single incision in the belly button – resulting in the potential for no visible scar. If you’ve just been diagnosed with benign gall bladder condition (such as gall stones or polyps), ask our surgeon if you are a candidate for the SILC procedure. The SILC Procedure requires only a single incision that is about 2 cm. By hiding this small incision within the belly button, the SILC procedure may eliminate the visible scars typically associated with gallbladder related surgery. The single incision in the belly button avoids the large incision made in the lower abdomen involved in typical open cholecystectomy (gallbladder removal) and the multiple small incisions required for standard laparoscopic surgery. The latest advancement in laparoscopic surgery, a cholecystectomy performed using the SILC allows for the removal of the gallbladder through a small incision made in the belly button which measures 20 mm, or slightly smaller than the diameter of a nickel. To perform this procedure, the surgeon will insert into the belly button a SILC, a soft and flexible instrument equipped with three distinct openings which allows for the use of three surgical devices at the same time. When the surgery is complete, the specimen is removed from the belly button, leaving one incision which may not be visible upon healing. Recovery from the SILC Cholecystectomy may be similar to the 2-week recovery time associated with laparoscopic cholecystectomy. The next-generation SILC Procedure, a procedure option performed through a single incision in the belly button. This enhanced procedure has become accepted as a mainstream treatment for gallbladder removal. 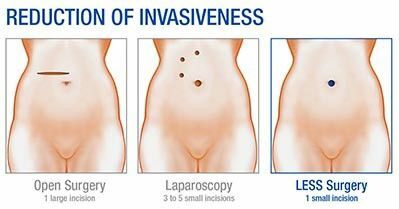 Standard laparoscopy is performed using a laparoscope, a long thin device containing a light source and camera, thus resulting in a relatively smaller incision size. The laparoscopic device sends live video images to a video monitor so your doctor can clearly see the inside of your abdomen during the surgery. Only small incisions are needed to insert the scope and other surgical instruments. In open surgery a large incision is made below the ribs on the right side of the abdomen. This incision is held open with forceps and requires the division of several abdominal muscles. * Actual results may vary along with number, size and location of incisions. Consult your surgeon. You may have a option regarding the type of surgical procedure you undergo for gallbladder removal. The SIS Cholecystectomy offers potential benefits over other approaches, including the potential for no visible scar, less pain due to fewer incisions compared to traditional laparoscopic surgery and a faster recovery time than open surgery. The table below details the differences between the various options. These results detailed below are typical – your results may vary. All surgery presents risk. Any procedure using the SILC technique is major surgery, and as with any surgery, complications may occur. Possible complications include the risks associated with the medications and methods used during surgery, the risks associated with any surgical procedure (up to and including death), and the risks associated with the patient’s medical condition and history. Risks specific to the SILC include the possibility of conversion to a standard laparoscopic or open procedure, and the specific risks associated with those procedures. Your individual risk can be determined only in consultation with your surgeon; only a medical professional can determine if a procedure using the SILC is right for you.